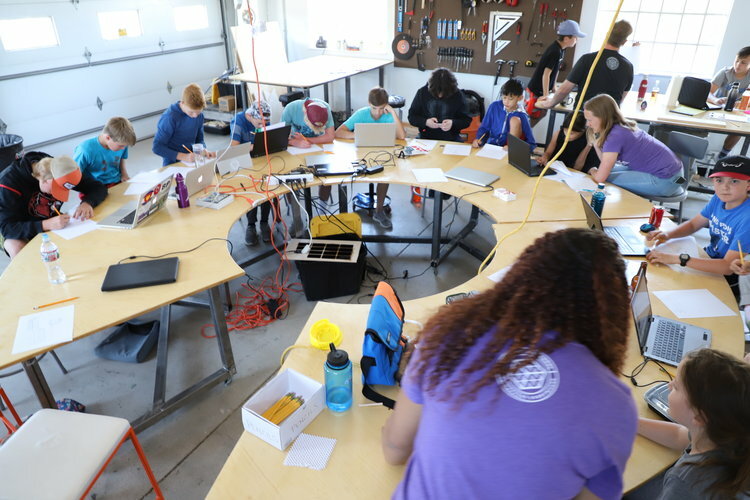 The CUBE offered ten summer camps ranging from building PVC instruments to robot Olympics. Check out the descriptions and images below for more details. And then get ready for summer 2019. In this camp, campers will learn some basic cell biology through making the world's greatest food: pizza. Students will learn how to mix and toss dough, as well as how to sauce, cheese, top, and cook pizzas. They will get to cook using a professional-grade oven, and all the while, learn about how yeast causes dough to rise and what aspects of pizza are so appealing to the human brain. Molto Bene! In this camp, students learn about basic robotics and computer programming. They will use this knowledge to build gladiator-like robots who will compete in events like racing, javelin throwing, and all-out battle. If your child is interested in building, programming, and/or competition, or you think they might have knack for something like robotics, then please join us. One of the foundations of our school is giving all students an opportunity to work with cutting edge technology. At this camp, students will get trained on and work with top-of-the-line 3-D printers and laser cutters. Our teachers will help students to design what they’d like to print, help them learn how to print it, and show them how to care for it. Campers will leave the camp with at least two pieces of work they designed and created! If you have a son or daughter who can’t stop playing Fornite, or any other video game, this is the camp for them. Campers will learn about how streaming works, and they will get a chance to create their own streamable video game, learning about all the necessary computer science and programming that goes along with it. Campers will have the opportunity to learn about garden sculpture at the Denver Botanic Gardens, and they will mix and pour concrete planters and program micro computers to sit in them that sense low moisture levels and send you an email alert to water them. Your plants will never die again, and campers will get the chance to learn about material design and computer programming. Plus, they will get their own planter to take home. This camp introduces the physics of rock climbing as a method for campers to practice or learn Spanish. Spain is one of the world’s leading rock climbing destinations. The CUBE believes learning needs to happen in authentic, real world situations. Students shouldn’t learn Spanish by conjugating verbs in a quiet classroom. They should constantly be using the language to communicate with each other. Our veteran Spanish instructors will teach campers the basics of Spanish culture and vocabulary for rock climbing, and they will combine them a unique two-day experience (no Spanish education or rock climbing experience required). ¡Suban! Campers will learn the fundamentals of music theory and the physics behind how musical instruments generate sound. They will apply this knowledge to build and play their very own instruments made from PVC pipe and other simple materials. No music experience required!